Statement of Problem: In recent years, direct metal laser sintered (DMLS) metal-ceramic-based fixed partial denture prostheses have been used as an alternative to conventional metal-ceramic fixed partial denture prostheses. However, clinical studies for evaluating their long-term clinical survivability and acceptability are limited. Aims and Objective: The aim of this study was to assess the efficacy of metal-ceramic fixed dental prosthesis fabricated with DMLS technique, and its clinical acceptance on long-term clinical use. Materials and Methods: The study group consisted of 45 patients who were restored with posterior three-unit fixed partial denture prosthesis made using direct laser sintered metal-ceramic restorations. Patient recall and clinical examination of the restorations were done after 6months and every 12 months thereafter for the period of 60 months. Clinical examination for evaluation of longevity of restorations was done using modified Ryge criteria which included chipping of the veneered ceramic, connector failure occurring in the fixed partial denture prosthesis, discoloration at the marginal areas of the veneered ceramic, and marginal adaptation of the metal and ceramic of the fixed denture prosthesis. 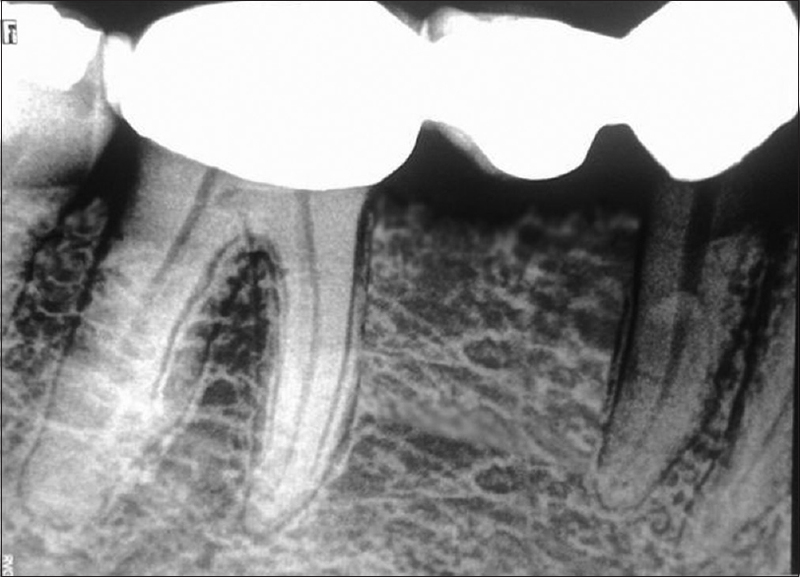 Periapical status was assessed using periodical radiographs during the study period. Survival analysis was made using the Kaplan-Meier method. Results: None of the patients had failure of the connector of the fixed partial denture prostheses during the study period. 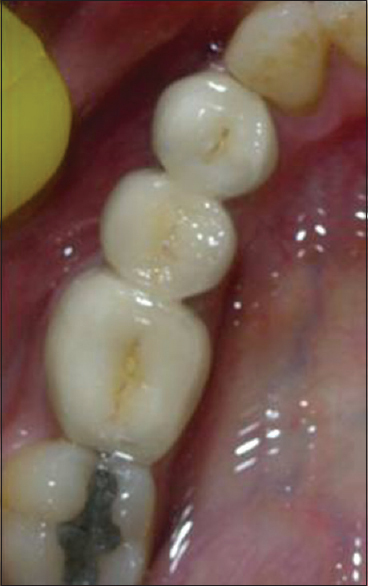 Two exhibited biological changes which included periapical changes and proximal caries adjacent to the abutments. Conclusion: DMLS metal-ceramic fixed partial denture prosthesis had a survival rate of 95.5% and yielded promising results during the 5-year clinical study. A significant change from conventional castings is the introduction of direct metal laser sintered (DMLS) technology used for metal-ceramic restoration. ,,,, Various in vitro studies on DMLS have yielded promising results for its wider clinical usage. Yet studies regarding clinical longevity and the survival rates for posterior metal-ceramic fixed partial dentures done with DMLS technique is lacking. Hence, this study was undertaken to assess the clinical acceptability of posterior metal-ceramic fixed partial denture prosthesis made with DMLS technique. In this study group of 45 patients, (24 male and 21 female patients) who received the metal-ceramic posterior fixed partial denture done with DMLS technique had been evaluated periodically using modified Ryge criteria for the period of 60 months to assess the clinical longevity of these restorations. At the end of evaluation period of 60 months for fracture resistance 39 restorations which had smooth, shiny surface and without any defects were rated Alpha [Figure 1], four restorations with mild chipping of the veneering porcelain and was not impairing the functioning of the metal-ceramic prosthesis was reported Bravo [Figure 2], and two restorations reported Charlie had chipping of veneering porcelain impairing esthetics and exposing the framework material. The exposure was reported at the distolingual cusp areas of one case [Figure 3] and at the area of central fossa in the other case. These two restorations which had Bravo rating during the end of the 3 rd year gradually progressed to the Charlie rating at the end of the 5 th year of the study. 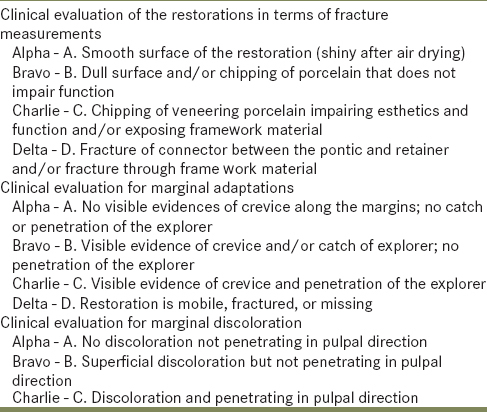 On visual and probing examination for marginal adaptation, 43 restorations reported with Alpha rating and one each was reported for Bravo [Figure 4], and Charlie and no cases reported Delta ratings. For marginal discoloration, only two cases reported Bravo rating and all other cases reported Alpha rating. 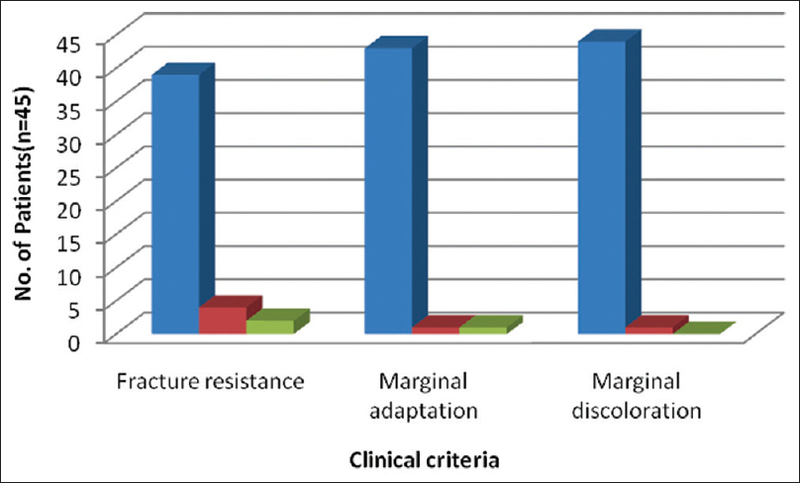 The distribution of clinical criteria and its ratings for the study group is shown graphically [Figure 5]. Radiographic assessment for the period of 60 months had 43 cases with no evidence of any periapical changes [Figure 6]. Only one case reported with radiographic evidence of incipient proximal caries requiring restoration of the proximal teeth adjacent to the abutments, and the other with abutment teeth exhibiting periapical changes requiring root canal therapy during the study period. None of the cases had fracture of the framework, and retention was maintained for all the posterior fixed partial denture cases. 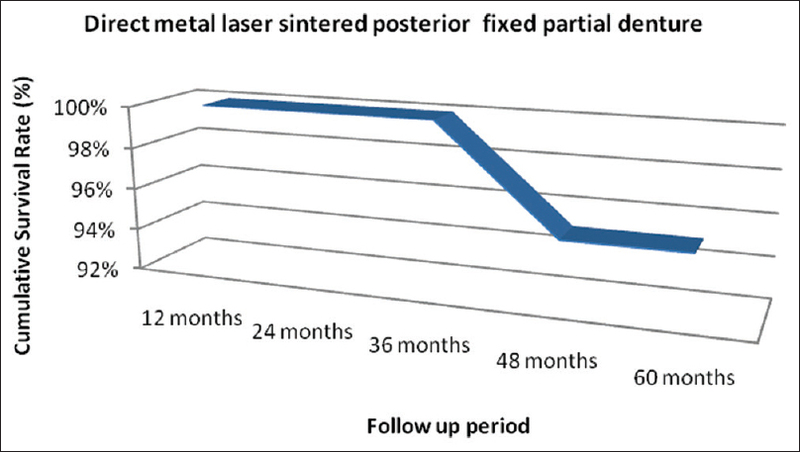 The survival rate of the laser sintered posterior metal-ceramic fixed partial denture without any major fracture of the ceramic material, or the connector framework was 95.5% with confidence interval of 78-96% during the observation period of 60 months [Figure 7], and mechanical complication [Figure 8] occurred as a result of major chipping of the veneer porcelain was only 4.5% with confidence interval of 85-98%. Taggart was successful in using wax to form the pattern and used pressure to cast the alloys which formed the basis of conventional casting technique. Conventional form of casting is still widely practiced and had become the mainstay of casting alloys used in dentistry. ,, Due to the use of computer-aided design and computer-aided manufacturing in dentistry, the trend in dental alloy castings has also undergone tremendous change. [1-] The laser sintering process was introduced by Deckard and Beaman, referred to as three dimensional printing because it builds up the framework in a series of successively thin layers in the range of 0.02-0.06 mm. A laser beam is focused on a bed of powdered metal, and these areas fuse into a thin solid metal layer. After the formation of the first layer, another layer of alloy powder is then laid down, and the next slice of the framework is produced and fused with the first. When all these layers have been built up, the solid copings and bridge framework are taken from the machines which are then sandblasted and ultrasonically cleaned. ,, The metal laser sintered copings have a primary composition of chrome cobalt alloy. The other ingredients include tungsten, molybdenum, iron, silicon, cerium, manganese, and carbon. These laser sintered variants are nickel- and beryllium- free. The allergic response to chrome cobalt alloy is rare. , Laser sintered crowns and bridges are of a particle size of 3-14 μm and when combined with very fine point laser of 0.1 mm results in a higher density of around 99.9%, resulting in stronger copings with practically no voids. Hence, the laser sintered process results in highly accurate and well-detailed restorations. 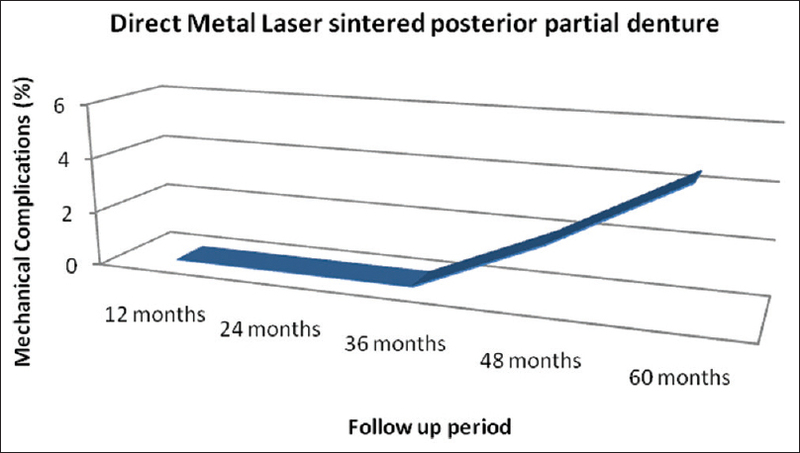 , Laser sintered metal crowns were compared with conventionally made cast crowns for the internal fit and the results indicate the marginal gap for laser sintered crowns was on an average of 65 μm when compared to the conventionally made crowns with a value of 150-125 μm. ,,, The earlier clinical studies conducted with this laser sintered technology were made only for single unit metal-ceramic crowns. Based on the promising results obtained from various in vitro studies and an in vivo study for single unit crowns for DMLS technique, this study on fixed partial denture made from DMLS technique was undertaken since the complex biomechanical functions of posterior metal-ceramic fixed partial dentures which have connectors is entirely different from the function of single unit metal-ceramic crowns. 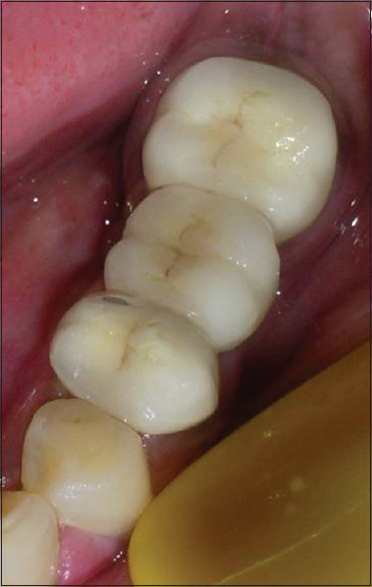 The clinical follow-up of laser sintered posterior metal-ceramic fixed partial denture indicated chipping of the veneering porcelain at 60 months for two cases indicating the need to replace the posterior fixed partial denture due to esthetic concerns over the study period. Chipping might be attributed to the anatomical preparation of the abutment teeth in the arch, the homogeneous dimensions of the veneer ceramic, and the ceramic bonding to the metal copings. Minor chipping which occurred for the 4 cases was not further progressing during the study period. The failure rate in this study for the direct metal sintered posterior fixed partial denture obtained was 4.5% [Figure 7] which was in the range comparable to conventionally done cast metal-ceramic restorations which ranged from a value of 2.50% to maximum of 7.60% obtained from other study. The veneer fracture reported with opposing natural dentition denotes the biomechanical differentiation of load applied onto the veneered ceramic of the laser sintered posterior fixed partial denture. 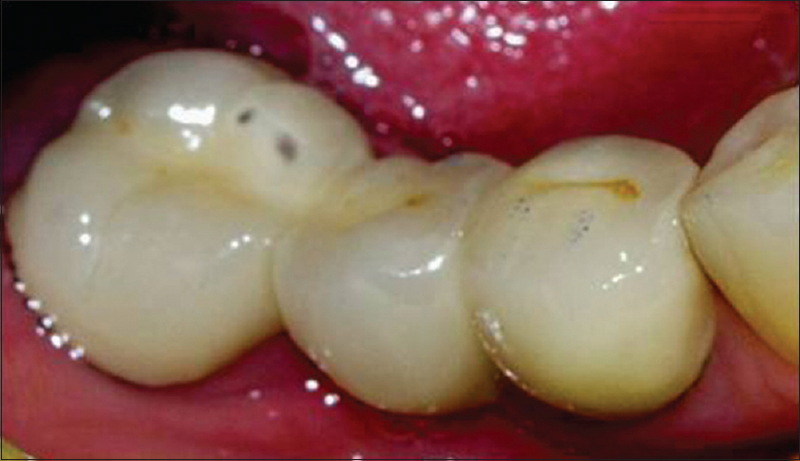 Marginal discoloration and caries obtained in this study were 4% in comparison to range up to 21.20% obtained for conventional cast metal-ceramic restorations  during the same study period denoting the lack in hygienic measures taken by the patient to manage the marginal gingiva and crevices. These patients were instructed, and measures were made to improve the hygienic conditions during the study period. The survival rate of laser sintered metal-ceramic posterior fixed partial denture restorations was 95.5% in comparison to the conventional cast metal-ceramic fixed partial denture of 84.3%. 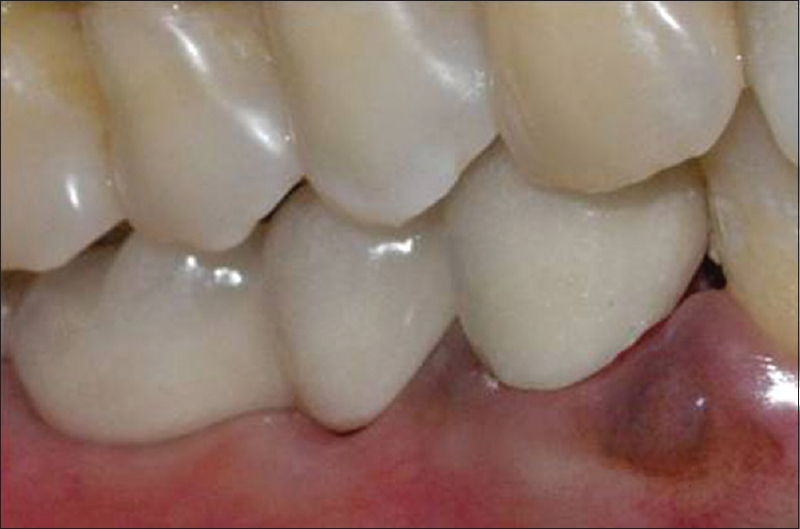 Mechanical complication occurring as a result of major chipping of the veneer porcelain was only 4.5% which indicated promising clinical efficacy of the laser sintered metal-ceramic posterior fixed partial dentures. Clinical performance of posterior fixed partial dentures done with DMLS technique needs more years of clinical research to be comparable with conventional metal-ceramic which has reports of more than 20 years of clinical service. 60 months by proving their clinical survival rate of 95.5% indicating greater clinical acceptability for use in day-to-day clinical practice. Tinschert J, Natt G, Hassenpflug S, Spiekermann H. Status of current CAD/CAM technology in dental medicine. Int J Comput Dent 2004;7:25-45. Pallesen U, van Dijken JW. An 8-year evaluation of sintered ceramic and glass ceramic inlays processed by the Cerec CAD/CAM system. Eur J Oral Sci 2000;108:239-46. Mehl A, Hickel R. Current state of development and perspectives of machine-based production methods for dental restorations. Int J Comput Dent 1999;2:9-35. Deckard C, Beaman JJ. Process and control issues in selective laser sintering. ASME Prod Eng Div Publ Ped 1988;33:191-197. Ibrahim D, Broilo TL, Heitz C, de Oliveira MG, de Oliveira HW, Nobre SM, et al. Dimensional error of selective laser sintering, three-dimensional printing and PolyJet models in the reproduction of mandibular anatomy. J Craniomaxillofac Surg 2009;37:167-73. Abou Tara M, Eschbach S, Bohlsen F, Kern M. Clinical outcome of metal-ceramic crowns fabricated with laser-sintering technology. Int J Prosthodont 2011;24:46-8. Ryge G. Clinical criteria. Int Dent J 1980;30:347-58.
International Powder Metallurgy Directory Laser Sintering-Versatile Production of Tooling Inserts, Prototype Parts and End Products from Metal Powder. International Powder Metallurgy Directory; 2011. Available from: http://www.ipmd.net/articles/0010887.html. [Last accessed on 2014 Aug 14]. Jokstad A, Bayne S, Blunck U, Tyas M, Wilson N. Quality of dental restorations. FDI commission project 2-95. Int Dent J 2001;51:117-58. Wagner J, Hiller KA, Schmalz G. Long-term clinical performance and longevity of gold alloy vs ceramic partial crowns. Clin Oral Investig 2003;7:80-5. Brown C. 3D Printing and Laser Sintering Technologies. Vol. 2. Inside Dental Technology, AEGIS Communications; 2011. Available from: http://www.dentalaegis/idt/2011/08/3d- printing- and- laser- sintering- technologies [Last accessed on 2014 Aug 14]. Yau HT, Hsu CY, Peng HL, Pai CC. Computer-aided framework design for digital dentistry. Comput Aided Des Appl 2008;5:667-75. Traini T, Mangano C, Sammons RL, Mangano F, Macchi A, Piattelli A. Direct laser metal sintering as a new approach to fabrication of an isoelastic functionally graded material for manufacture of porous titanium dental implants. Dent Mater 2008;24:1525-33. Wataha JC. Alloys for prosthodontic restorations. J Prosthet Dent 2002;87:351-63. Wiltshire WA, Ferreira MR, Ligthelm AJ. Allergies to dental materials. Quintessence Int 1996;27:513-20. Örtorp A, Jönsson D, Mouhsen A, Vult von Steyern P. The fit of cobalt-chromium three-unit fixed dental prostheses fabricated with four different techniques: A comparative in vitro study. Dent Mater 2011;27:356-63. Quante K, Ludwig K, Kern M. Marginal and internal fit of metal-ceramic crowns fabricated with a new laser melting technology. Dent Mater 2008;24:1311-5. Bindl A, Mörmann WH. Marginal and internal fit of all-ceramic CAD/CAM crown-copings on chamfer preparations. J Oral Rehabil 2005;32:441-7. Kokubo Y, Ohkubo C, Tsumita M, Miyashita A, Vult von Steyern P, Fukushima S. Clinical marginal and internal gaps of Procera AllCeram crowns. J Oral Rehabil 2005;32:526-30. Fusayama T. Factors and technique of precision casting Part I. J Prosthet Dent 1959;9:468-85. Bhaskaran E, Azhagarasan NS, Miglani S, Ilango T, Krishna GP, Gajapathi B. Comparative evaluation of marginal and internal gap of Co-Cr copings fabricated from conventional wax pattern, 3D printed resin pattern and DMLS tech: An in vitro study. J Indian Prosthodont Soc 2013;13:189-95. Akova T, Ucar Y, Tukay A, Balkaya MC, Brantley WA. Comparison of the bond strength of laser-sintered and cast base metal dental alloys to porcelain. Dent Mater 2008;24:1400-4. Pjetursson BE, Sailer I, Zwahlen M, Hämmerle CH. A systematic review of the survival and complication rates of all-ceramic and metal-ceramic reconstructions after an observation period of at least 3 years. Part I: Single crowns. Clin Oral Implants Res 2007;18 Suppl 3:73-85. Erratum in: 2008;19:326-8. Jung RE, Kalkstein O, Sailer I, Roos M, Hämmerle CH. A comparison of composite post buildups and cast gold post-and-core buildups for the restoration of nonvital teeth after 5 to 10 years. Int J Prosthodont 2007;20:63-9.